In September, four sport students engaged in intensive extra-curricula internationalisation activities in order to enhance their study, professional and personal intercultural experience. This BU blog article combines their personal reflections. Sport management and sport development students Luke Frary, John Bryson, Oliver Johnson and Stefan Ferencz significantly contributed to the Student Seminar and the main conference of the European Association for Sport Management (EASM) in Turkey from 7 to 14 September (http://blogs.bournemouth.ac.uk/research/2013/09/19/bu-sport-students-and-academic-succeed-at-european-association-for-sport-management-conference-in-istanbul). Please read about their reflections in more length below the pictures. 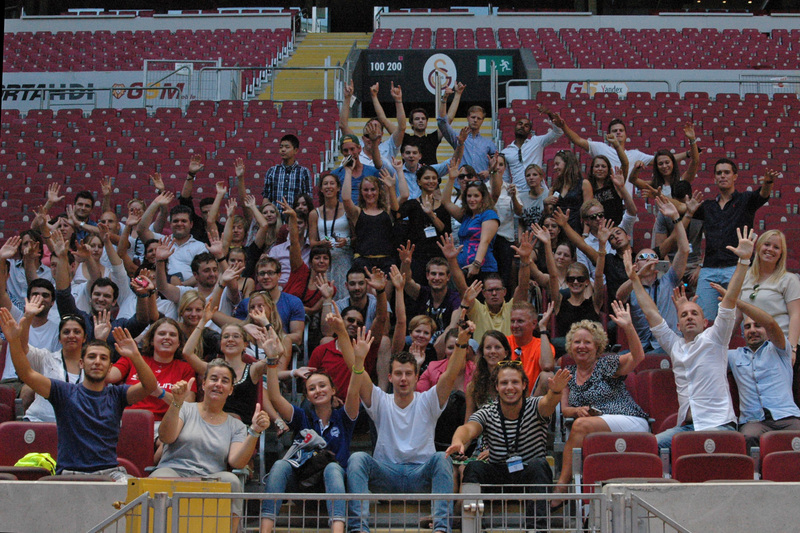 Part of the international student group during venue visit and on-site lecturing in Istanbul. John Bryson (second from left) during team work. 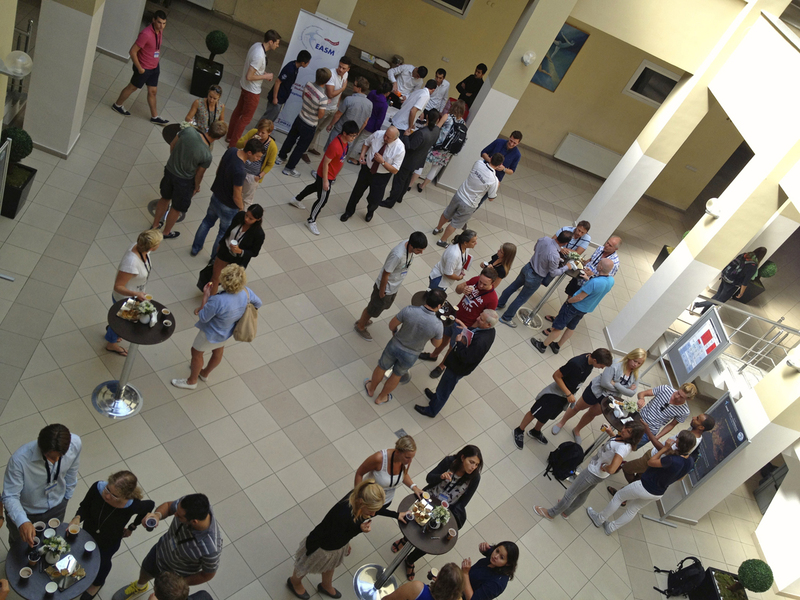 International students mingling during coffee break. In the middle, BU students talking to retired UNICEF Partnership Director. Stefan Ferencz (third from right) with his team, awarded for winning their case competition. “I travelled to Istanbul along with three other Bournemouth University students to attend the European Association of Sports Management (EASM) Masters Student Seminar and EASM Conference. The seminar and conference provided me with some excellent experiences including presenting my dissertation research, working in a team with other international students in a sports management game, gaining an insight into cutting edge sports management research and issues and also making many professional and personal contacts. With help and guidance from Dr Tim Breitbarth I was able to present my dissertation research at the corporate social responsibility workshop during the EASM Conference alongside many of the authors that I had referenced in my own work. This was a rewarding experience as I was able to make a contribution to the conference while showing off my dissertation that I had worked on throughout the previous academic year. During the student seminar I also worked on a sports management game. I found this particularly interesting as it allowed me to work on a real life scenario to devise and implement solutions. 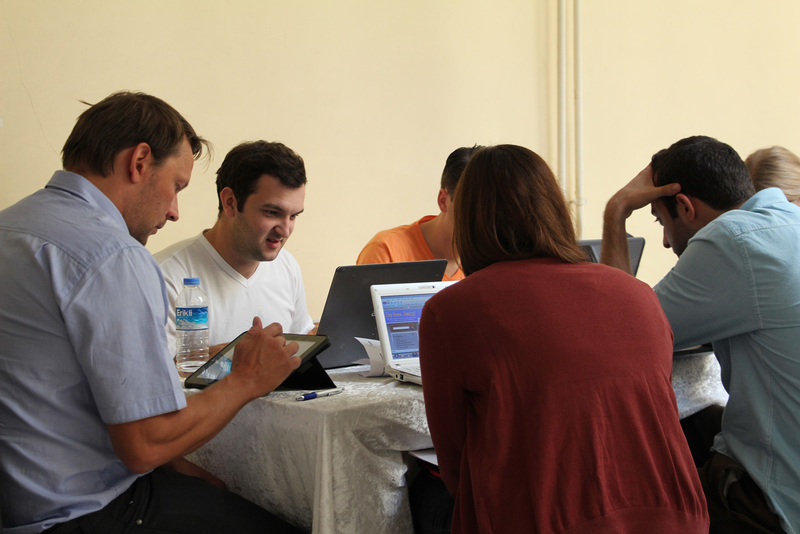 During the management game I was required to work in a team with students from The Netherlands, Finland, Germany and Turkey. I really enjoyed the opportunity to work alongside other students from different countries and cultures and the challenge of combining many different ideas and perspectives into a successful end product. In the end our hard work paid off as we won our case competition and were able to work on the project further and present it our final solution at the main conference. The seminar and conference also provided me with the opportunity to make many professional and personal contacts that will be very useful going forward in my career. The management game was especially useful for networking as we were devising solutions for industry professionals and it was a useful task to showcase your imagination, creativity and problem solving skills. After a short ride we arrived with a warm welcome at the reception of our hotel (which clearly was going to exceed all expectations of accommodation at a student conference). Here we were informed that we would be separated and would be sharing rooms with students from other European Universities as a way of encouraging the ‘multicultural atmosphere’ that the conference programme alluded to. In hindsight, we were extremely naïve as we approached this with scepticism – one of the many valuable lessons we learnt during the conference. After a short while we were escorted to the Sports campus of Mamara University for the opening of the Masters Student Seminar. Once again the scepticism set in when we heard the words ‘ice-breaker’ bellowed above the closed conversations taking place in small clusters of previously familiar friends. We then proceeded to play a number of games that finished with holding hands and dancing around in a circle to a Turkish song. Little did we know that this song would become a regular during the conference and a very memorable part of the trip. Over the next few days we got to know the various individuals from all over Europe as we engaged in the Masters Student Seminar. The days started with Key Note speeches on some highly engaging topics. The topics covered where not entirely different to those I had covered at Bournemouth, but through adding an international perspective, the approach becomes refreshingly different. Later in the week we were divided into groups to work on a management game. I was grouped with students from Germany, Finland and Holland. Once again it was insightful to work with the addition of an international dimension. It became clear that when studying in just one country, it is easy to adopt a narrow approach to your studies. In between the keynote speakers and the management game, we were able to select from a number of sports activities. For me the highlight was kayaking along the Bosphorus and mooring alongside a Turkish restaurant to sample a local snack. The following week welcomed the main conference. There were some very interesting presentations and there were many great opportunities to generate ideas and inspirations to take into one’s own studies. In the evenings the hospitality the Turkish had arranged was phenomenal. It was great to share these moments with the large group of new friends we had made. 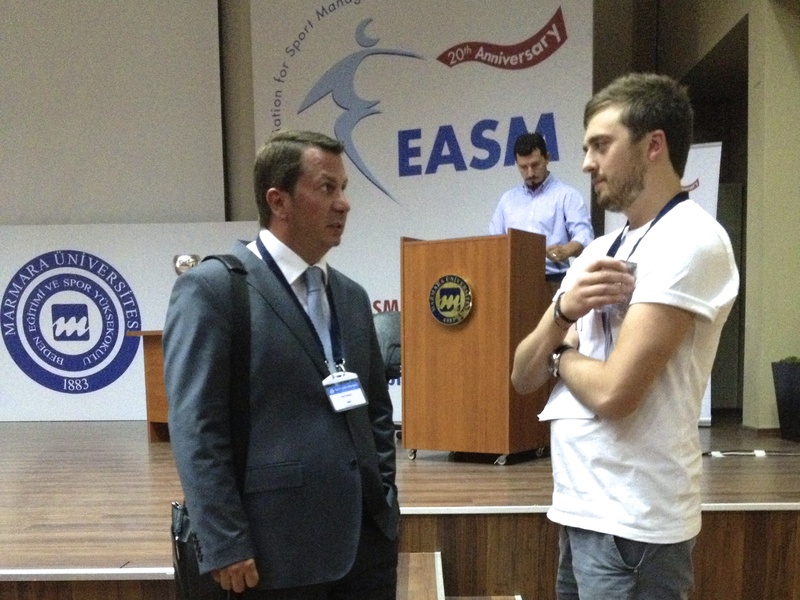 “The EASM 2013 conference in Istanbul has been a unique experience that has given me the opportunity to expand my knowledge in the field of sports management and also to create a network of sports management students from around Europe. 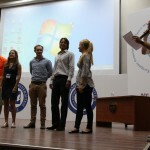 The adventure began with the Student Seminar held at one of the campuses of Marmara University. Presentations delivered by academics and professionals were soon followed by the Management Game. The Management Game focuses on a very engaging and challenging group activity which gave me the opportunity to work with students from different countries, to develop communication and decision making skills and to work effectively under time pressure. I feel that I have benefited from all the challenges that arose during group work, from the research required to deliver the presentation as well as from the reward of producing the best case study for the allocated subtheme. The main conference enabled me to learn about current issues and trends in the field of sports management, thus providing me with useful information that I will utilise in my final year. Having observed how speakers structure their presentations, I now feel more confident about speaking at the presentations required for some of my units during level H. The conference has been an amazing source of information provided by well-known academics and professionals and has generated many ideas for my future dissertation. Along with great social and sporting activities organized by staff, the conference has ended in style, with a superb boat trip on the Bosporus. “Upon first hearing about the opportunity to participate in the reputable European Association of Sports Management conference and Master Student Seminar in Istanbul, I was instantly attracted and impressed that my university was able to offer this to me. I applied in order to further my working experience, looking to participate in activities outside my comfort zone and within a foreign environment. I believe this is crucial to any student’s development, as not only does such an activity like appealing on a CV to employers, it helps to develop key characteristics such as communication, team work and working under pressure within a foreign environment. A factor that enabled me to participate in the conference was the backing of the Global Horizons Fund, as they seek to provide financial assistance to students, like myself, who are enthusiastic and eager to learn or participate in competitions abroad to further their education. Organisations such as Global Horizons make such an opportunity all the more attainable, as there are often financial restrictions associated with learning abroad which often dissuade students from participating. My week in Istanbul was split into two halves: the first half, as part of the Master Student Seminar, was based at Marmara University and the other half, in the heart of Istanbul, at the Istanbul Convention and Exhibition centre for the main conference. The structure of the Master Student Seminar was organised excellently, as there was balanced daily routine of informative, interesting speakers and leisure activities. The main focus of the seminar was the Master Student Seminar competition, where students were randomly assigned to multi-national working groups. The aim was to put together a presentation and report on an assigned topic. I was assigned to the topic of Corporate Social Responsibility, whereby our group had to propose an idea, on behalf of a local company, in order to promote physical activity amongst the community. Initially, I did find the task challenging, as the groups were comprised of foreign students, it was occasionally difficult to communicate effectively. However, I believe that our group gelled remarkably and were able to collate a strong argument for our case. This was proven as we were selected as the winners of our topic, where we would progress to present at the main conference in front of a jury of astute professionals and conference attendees, competing against other student groups’ topics. Personally, I have very little experience in presenting in front of a large audience; therefore I initially felt the prospect of doing so very daunting. Nevertheless, it was a fantastic experience to showcase our hard work at such an esteemed event. My group was eventually announced as winners of the overall competition, an achievement that I am extremely proud of. Although the work involved was demanding, there was allocated time to see the sights of wonderful sights of Istanbul and to have fun. My personal highlight of the trip was kayaking up the river Bosporus and under the Fatih Sultan Mehmet Bridge, a spectacular sight. As mentioned previously, the organisation of the trip was excellent, with the assistance of several Marmara University students, who would often act as tour guides always willing to recommend places for us to visit and making sure everyone was looked after.